A Jarl is a ruler of one of the nine holds of Skyrim, equivalent to a Cyrodiilic Count. The jarls of Skyrim are largely autonomous, though they all swear fealty to the High King. Most jarls have their own personal housecarl and steward, and some also have one or more thanes in their service. Many also have a court wizard in their service who is also sometimes the only spell merchant in town. 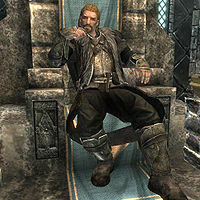 The game begins with nine jarls ruling the holds of Skyrim, four affiliated with the Imperial Legion, four with the Stormcloak Rebellion, and Balgruuf the Greater of Whiterun who is initially neutral. All except Elisif the Fair can be supplanted by a new jarl who is more supportive to the opposing force, based on your actions during the game. This depends on which force you choose to ally with in the Civil War, and jarls will be replaced when you help a side to capture a city they do not control, or through the negotiations made during Season Unending. Newly-instated jarls will gain a "Jarl" prefix to their name and move into the jarl's residence for that hold. Deposed Imperial governments will generally seek refuge in the basement of the Blue Palace in Solitude, while deposed Stormcloak governments will go into exile in the Palace of the Kings in Windhelm, where they will be found seated around the dining table. The jarl, their housecarl, their steward, and their family will be exiled together, and due to the part you played in their exile, they will dislike you. Several jarls, however, will go elsewhere if they are ousted from government. Jarl Korir and his family will move into Brunwulf Free-Winter's House in Windhelm and Dengeir of Stuhn will go to Candlehearth Hall. Brina Merilis will move to The Winking Skeever in Solitude and Kraldar will move into Erikur's House. Maven Black-Briar will simply return to her normal routine in Riften, as will Sorli the Builder to Stonehills if either jarl is removed. Vignar Gray-Mane would have went to Viola Giordano's House if exiled, but it is impossible for this to happen. *Jarl Balgruuf is initially neutral in the civil war, but will ultimately declare loyalty to the Empire during Message to Whiterun, regardless of who the player sides with. The Jarl of the Pale (either Skald or Brina Merilis) does not have a steward. Strangely, Jarl Laila Law-Giver's family will not be exiled with her should the Empire take Riften. Though Saerlund possibly remains due to his Imperial sympathies, her other son Harrald, who is a staunch Stormcloak, will remain also, and both will still behave as if the Stormcloaks control Riften (Saerlund will still warn of Stormcloak censorship, for example). The same also applies to Jarl Balgruuf the Greater's children. They will instead hide in the basement of Dragonsreach, likely because their initially planned roles in The Whispering Door would complicate the quest should they be exiled. The Jarls of Falkreath, Winterhold, and Hjaalmarch do not have court wizards. Brunwulf Free-Winter is the only jarl who never has a housecarl. If you join the Stormcloaks and complete the Battle for Solitude, instead of being exiled or killed, Jarl Elisif the Fair will be captured by Ulfric and coerced into renouncing her support for the Imperial Legion in favor of the Stormcloaks. Her steward, Falk Firebeard, interprets the act of allowing Elisif to maintain her Jarlship as a masterful political stratagem on Ulfric's part. Erikur and Hrongar were originally intended to become jarls, and still remain in the jarl faction. Erikur was to replace Elisif the Fair, who was to be murdered in Boethiah's Bidding. Hrongar was to replace Balgruuf the Greater after the latter was killed by his children during The Whispering Door. Somehow killing the incumbent jarls can trigger dialogue referencing the scrapped quests. Bryling is also in the jarl faction for unknown reasons, and has dialogue recorded to grant thaneships in Solitude, implying she was also originally intended to serve as jarl at some point, possibly as a Stormcloak replacement for Elisif or Erikur, judging by her seemingly pro-Stormcloak disposition. This page was last modified on 5 July 2016, at 06:00.